At The Beauty Rooms & Day Spa surrender your mind, body & spirit to a deluxe massage. Your skin is gently dry brushed and drizzled with warmed exotic oil, an ancient recipe from the Fijian Isles containing essential vitamins and antioxidants. 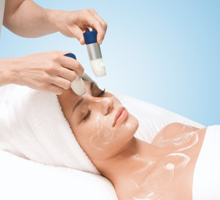 A warm masque is applied to hands then your body is wrapped while a face and scalp massage is performed. Hot stones are then placed on the body. 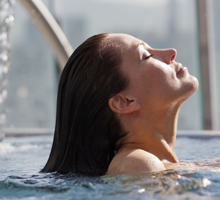 Hydrating the skin and detoxifying the system, this body treatment will leave spa goers’ minds refreshed, relaxed and the body naturally restored. This journey starts with a warm milk bath foot soak to soften and refresh the feet, then buff away rough skin with natural Fijian Sugar Rub. A rich foot mask using the body butter is applied and feet are wrapped. Clients can then relax on the treatment bed and experience a conditioning hair and scalp ritual. To complete this treatment a Lomi Lomi de-stressing back massage will have your clients feeing they have floated to the islands. Warmed stones are placed on the body and combined with a nourishing Exotic Body & Bath Massage oil to release tension, restore balance and increase positive energy flow. The stones are used to gently encourage sore muscles to relax and surrender as circulation increases bringing a sense of well-being and harmony. A beautiful ritual commencing with milk bath foot soak to soften, soothe and refresh the feet, then rough skin is buffed away with the Sugar Rub. Tension starts to release with a scalp and shoulder massage followed by a full body pregnancy massage helping to relax, reduce stress whilst treating the common discomforts of pregnancy. 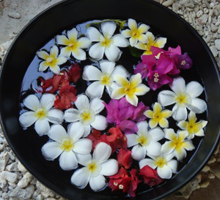 Pure Fiji nourishing oils improve skins elasticity, hydrate and nourish the skin. Transporting mother and bump to a tropical exotic paradise. Alleviate stress & tension, this massage benefits many aches and pains. We concentrate on the head, neck, back shoulders and face.